With "I Put a Spell on You" Screamin' Jay Hawkins hit the stage with one of the most unusual shows I've ever seen. I only saw Screamin' Jay Hawkins once, at a small club in Santa Barbara and he was strangely spectacular. The costume, snake around his neck, bones in his nose, flash paper, and staff with the skull on it symbolized the entire Screamin' Jay Hawkins show. The only thing I've seen that has come close would be Dr. John the Night Tripper, but "Gris Gris Gumbo Ya Ya" had none of the voo-doo of Screamin' Jay Hawkins. This show was truly one of a kind. I like the strong blue, red, and violet tones in the background and all the colors that give a little thickness to the flash paper from his hand. 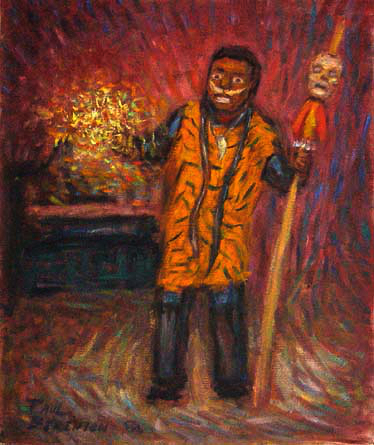 PaulB's Pointillistic/Impressionist original oil paintings of Rock & Roll and various prints and poster formats of a wide variety of subject matter by the Pointillistic/Impressionist oil painter from landscape/waterscape paintings, dance, sports, portrait, to classical figures, flowers, rock and roll, Brazil, and Rock & Roll paintings and prints are available for purchase for as little as $24.95 for an 8" x 10" matted print on photo pape. Pointillistic/Impressionist Giclee prints of Rock & Roll on real canvas or heavy watercolor paper are available. One of a kind Rock & Roll embellished prints, which are Giclee prints retouched in genuine oil paint by PaulB. Unless noted PaulB's original Pointillistic/Impressionist oil paintiings are oil on canvas. Paul Berenson's pointillistic/Impressionist oil paintings are in privale collections around the world, including the downtown Los Angeles Athletic Club and have appeared in numerous publications, including the New York Philharmonic Playbill. PaulB.com also builds websites and PaulB is a member of the LA Web Professionals Group.